Do you remember my earlier post and the recent ticket? Well, I got an answer: Well well, "threaten them with a criminal case" usually works against the corrupted ones. They announced the change exactly one day before my deadline. Yep, I'm pretty smug. Considering that IWI was always RMT-ing, it was its purpose, CCP acting like they just caught them is pathetic. Probably the not corrupted devs now defeated the corrupted ones, supported by the Valve case and my guarantee that they won't go unnoticed. The icing on the cake is that CCP Falcon had to write the devblog. In our long-standing tradition, I send a song to him to celebrate this event. To leave valuable content in this post, let me reiterate: corruption cannot survive in a free-market setting. No moralization, posting and whistleblowing could stop the devs from twisting the game for their buddies and "business" partners. But customers leaving did the job. Also, the multinational nature of an MMO guaranteed that there will be at least a few countries where their shady activities are forbidden and risk their business there if they don't stop doing it everywhere. Nice win for capitalism. 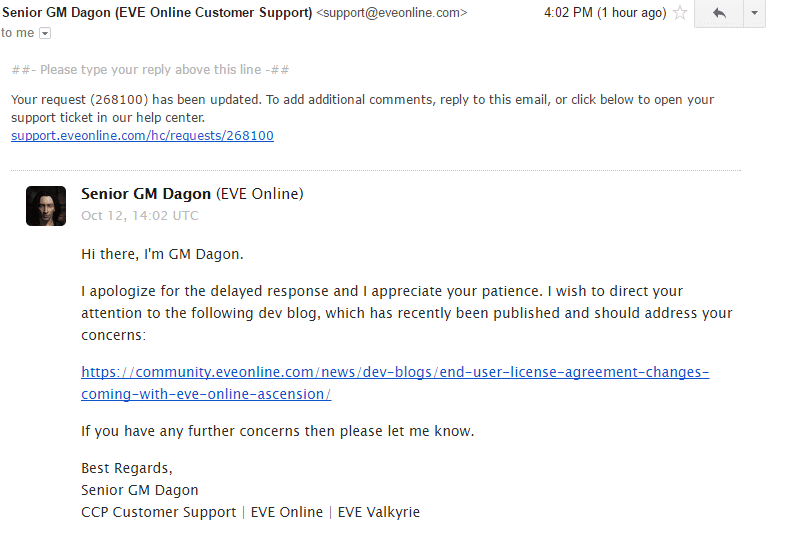 PS: I'm fully aware that it's against the EULA to publish GM responses. But it has an added benefit of that I can't crawl back if my League project goes down. Too sad that CCP sacrificed their game and their playerbase for RMT parties. Im curious if they can paddle back from here, or will try to find other ways to milk EVE until they can, which doesnt seem very long now. Lenny and Ironbank jumped ship before you threatened reporting CCP for gamblin. They knew this change was coming. Maybe corrupt CCP devs told them, I don't know, but it's pretty ridiculous to claim your threat suddenly made change their EULA and ban gambling sites. Even Lenny is banned (at least temporarily) which is good, to hell with his citadels. But CCP finally did a good thing and did it the harsh way, banning everything and using Falcon as a speaker. Isn't that exactly what should have been done? Why blaming them when they made a step in the right direction? I think they shall be encouraged to continue rather than mocked. Lenny is currently banned pending investigation. The damage is done though, can't wait to see the state of Eve in a few months. Btw, I left Eve 2 years ago, just here for the meta and reading your blog Gevlon. My current demand probably made them announce the planned change now. @Alexey: I'll be satisfied when EVE will be playable again. Currently they only stop bad behavior when they are literally threatened by cops breaking their front door for enabling child gambling. They still give some time for most casinos to cash out, immediately banning only the most outrageous ones. They aren't reformed and probably other kind of shady deals are done. What they did is exactly what they should have been done TWO YEARS AGO, when Somer made it obvious that casinos are RMT outlets. @Gevlon: Well, I'm not entirely agreed, but at least I understand you more now. As of banning only the most outrageous, we shall differ account bans and gambling ban. The former is for _already_proved_ RMT and effective immedeately, while the latter is being implemented through EULA changes which will take effect after AT (they just don't want too much ragequits). I guess more bans incoming after that as more investigations will be completed, that would be more silent bans though. An excellent and major step in the right direction! Well done with your contribution! I am going to say that CCP saw which way the wind was blowing and the timing is just a co-incidence. Alternatively, Lenny has been divesting for a while now. If you want to claim a conspiracy, CCP possibly looked at EvE and saw that RMT-gambling was a cancer but eliminating it in one go could kill the patient. The treatment was to give IWANTISK a year to wind down in an attempt to wean the population off gambling before they were forced to go cold turkey. Any evidence would come from the monthly isk balances. If the total assets confiscated is low, then you can be fairly sure that IWI knew what was coming. @dobablo: this case they could "wind down" IWI by banning one banker at a time, allowing the site to operate and pay out RMT money while constantly rising the price of RMT cash by increasing scarcity (the ISK in the wallet of the banned banker is gone). I'm not crazy, of course I don't claim that I did it all by myself. Gambling would have been eliminated from the whole industry without me anyway. 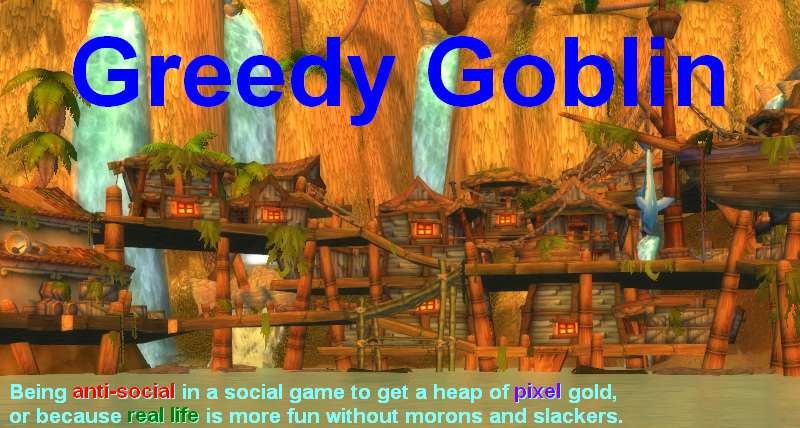 However I do believe that I forced their hand to act now and not among the last MMOs in 2018. You underestimate the vulnerability of CCP in this case. Valve is a big american company with lots of money. The authorities would surely first go after a small foreign company to get a precedent at court and then move to make Valve settle. My documentation about CCP-IWI would be a Godsent for the US authorities who probably don't even know EVE exists. Oh my god this is so sweet. I never thought I would see CCP ban third party gambling. It's about time, those guys were allowed to make an unimaginable amount of money just sitting on their asses doing nothing but move ISK around. People thought SP farming was pretty bad, it's nothing compared to gambling. Sadly I pulled the plug as well but oh well I'm happy to see them doing the right thing just one time. The amount of tears and drama to unfold will be great. Ah well my experience with eve-online. Step one. buy account with that multichar training promotion. Step two. find a bug/feature, report it without any feedback ingame, report it on reddit a month later, get permabanned. Step three. File the fraud case with paypal, get a refund. Wait, you think your one post on Saturday suddenly started an RMT investigation, and got them to get their lawyers into a room to make a new legalese EULA? If thats the case, you should worry, because IWI players have also filed petitions mentioning legal stuff. I think its brilliant, primarily because now you have to reconsider your CCP is conspiring against me, because, you have just said that you influenced CCP. Which means they are conspiring with you. So, when are you coming back to eve? Expect to see the citadel project speed up now, the pressure is on to create another income stream. I never played Eve but followed it closely. It's too bad they waited so long to actually do something about the RMTing as the damage may be irreversible. What? You mean unregulated gambling might lead to RMT? How is that possible? Surely, humans, being the most enlightened species ever, would never take advantage of such a situation for personal profit. In the voice of Nelson Muntz, and pointing at CCP: "Ha Ha!" I would have loved to have seen this "investigation." Yay! We finally see the end of Eve ingame gambling! That step was indeed overdue and CCP had to adapt to US court rulings any way. @Jack: No! CCP is still corrupted and only acted because their hand was forced (by the Valve case and by me making sure they can't just fly under the radar). The trading citadels are still here. The "EULA don't apply to content creators" is still here. RMT is still here, only the undefendable ones are banned. The "edgy" neo-nazis are still here. EVE is still not a place I'd recommend, so it's not a place I play. I will return to Eve when that degenerate CCP Falcon is given a pink slip. Observe as corruption finds more and more new and interesting ways to take root. Capitalism is inherently corrupt. The only time it had corruption-cleansing properties was back when it was just a dressing for protestantism. These times are long gone now. By the way, i reckon you'd like protestants. Very anti-M&S pro-meritocracy guys.